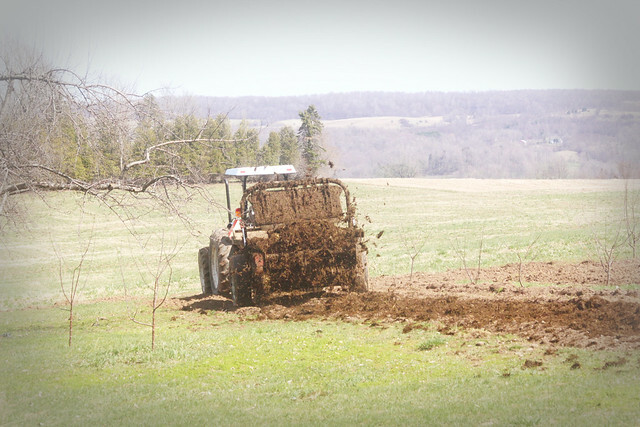 Okay, perhaps not, but it was here last week as Sean added in a trailer load of cow manure and bedding to our newly plowed and tilled areas and then tilled it under. I'm sure this was a popularity booster with our neighbors but I think it will work wonders with our clay soil. I'm sure your neighbours are used to it, living in the country. And cow manure is the least pungent one imo, nothing like chicken or pig poop... Fun fact: my mum wanted to ask her neighbours not to fertilize their fields right before my outdoor wedding three years ago, but couldn't think of a polite way to do it. Luckily none of them did anyway.